Get behind the wheel of a high-performance kart and zip around the half-mile track at speeds faster than other standard racing kart's top speeds! 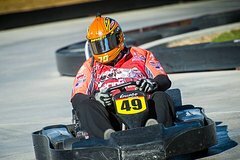 Learn how to commandeer the speedy karts through an instructional video before letting loose onto the curving track for 15 to 18 heart pounding laps. Located moments from the Las Vegas Strip, you'll get to test your need for speed with 15 to 18 laps of go-kart racing. Enjoy big racing action in an extremely fast high-performance kart and battle other competitors - family and friends, side by side, just inches off the ground. You may even get the opportunity to meet Gene Woods, the racing veteran and three-time US Open National Champion on Speedway Motorcycles. All necessary equipment such as helps, neck braces and safety orientation are included. This is a great day that's fun for the entire family.